I was standing on a ledge, facing a rock wall. The path at Water Canyon ended there; we couldn't go any higher. Looking down over my right shoulder, I saw a bottomless pit. One that I was supposed to descend. My stomach was churning, my head was spinning. Fear owned my body and I was at its mercy. "Lean back, lean back," Steffan the guide said encouragingly. "Then just start walking down the cliff. One step at a time. The ropes will hold you." "I can't," I said, frozen in place by sheer terror. My hands were sweating profusely. Tears streamed down my face. While Steffan tried to quell my panic, my friend Shari (who'd already descended) shouted encouragement up to me. Hiking down the canyon was no longer an option. I had to go over the cliff. I knew that when I started. But as I stood there paralyzed, all I could think about was, "Why have you done this to yourself? Were you crazy?" I hate heights. Sheer drop-offs are the worst. It's so easy to get complacent in our life and career. To stop trying new things. To be less than we are capable of being. Rather than experimenting with new approaches to our sales challenges, we fall back on our tried-and-true strategies. But buyers have changed and they're no longer as effective. Trying new things is risky. Our clumsy attempts often fail and we feel foolish. 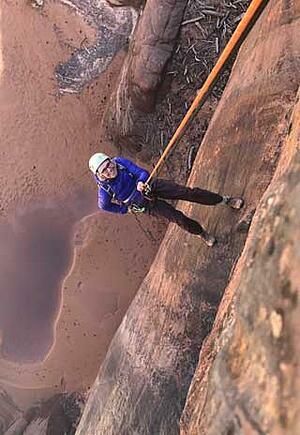 That's how I felt trying to rappel down the cliff—but stuck at the top. But I knew it was time to get out of my comfort zone. So here's what happened next. Out of the blue, Steffan asked me a totally out-of-context question: "Do you have any kids?" I looked at him like he was crazy. Why was he asking that right now when my life was clearly at risk. "Boys or girls?" he asked. "One of each," I answered. This Q&A banter went on for a few more minutes—and miraculously, I felt a real shift inside. Panic subsided. I went back to my rational brain. Still scared, but able to take action. Slowly, but surely I leaned backwards and walked my way down the cliff. When I hit bottom, I didn't feel elation. Just glad that I'd done it--in spite of the fear that overwhelmed me. I let out a long, deep breath complete with a big "Phew" at the end. That morning, I rappelled down five more cliffs before we got to a place where we could follow a path down like normal human beings. During a short break, I asked Steffan about his "kid" questions. He'd done them purposefully to snap me back into the real world, not the monstrous one I was creating in my mind. It was highly effective and an interesting lesson to me about fear and the power of simply shifting my mindset to better deal with life's challenges. I choose to live a life of continuous growth. It's not always easy. And honestly, I don't know exactly where I'm headed right now. But I do know that it will require me to stretch beyond what I am currently capable of. So I stretch. Outside my comfort zone. One step at a time... so I will be ready. P.S. Today I'm in Bogota, Colombia after speaking at the World Sales Forum in front of hundreds of people. Ten years ago, I was terrified of doing this. That's why I think it's essential for all of us to stretch out of our comfort zone. We're so much more capable than we think we are!